My wife and I live in the Northwest of England. We try to spend at least three months each year at the villa. We have been going to the area for the last twenty years or so. We love the area and have found the people to be very friendly. I suppose the main reason for buying the villa was the position and the view. The view is wonderful, the villa faces south and gets loads of sun. The position of the house is away from traffic and crowds. Luz is relatively quite, which we like but is near to the Lagos which has loads of restaurants and good night life. Luz is also very easy to get to from Faro airport, under an hour by car. We have fitted the house to live in so have made it a comfortable as possible and we are always trying to make improvements to it. The villa is not far from all amenities and we walk down to the shops for papers, food and the odd bottle of wine. I think that we have had meals in every restaurant in the village and would go back to most of theml. There are plenty around the area to be recommended. One of the other things that was important to my wife and I is that in the village there is a very good doctor and a dentist for the odd emergency. Thanks goodness not yet required! Two Bathrooms and clock room. En-suite bathroom to master bedroom. Bathroom includes bath with shower, toilet and bidet, whb, electric shaver point. Second bathroom to second bedroom has shower, toilet and wash hand basin, electric shaver point. Heating is available, if required. This will be charged at €8 a day. Fitted. If wood required please contatc local agent to arrange. Lounge/dining room. Three piece suite and dining table for 6 people. French windows at both ends of room opening on to balcony with views over village and sea. Book case, Television with DVD player and Sky digibox. Radio with CD and tape player. Instructions for oven in draw in kitchen. Instructions for microwave in draw in kitchen. Untensils in draw in kitchen. Dishes and cutlery in sideboard. The area has a round table with 6 chairs. DVD provided under the TV. The local gardenar will visit on a Monday to cut the grass. Also will visit on a Friday to clean the pool. Wonderful views over the village and the sea. Golf courses within easy reach of the villa: Boa Vista Golf (2km) is the nearest. Parque da Floresta is about 20 minutes away. Palmares to the East near Meia Praia beach. Alto Golf (9km) approx, eastwards, near Alvor. Penina Golf (15km), between Alvor and Portimao. All courses welcome visitors. Why fly with your clubs. Clubs can be hired at Faro airport for as little as €35 a week. The pool can be heated. Please contact local agent to arrange. Heating will be charged at €100 a week. The owners recommends around 27C. Notes on accommodation: Pool maintained by local company weekly. Wood for the wood burning fire can be arranged if required. Please make a request to Luz Servicos. Sufficient wood for 1 week is around €20. There will be a welcome pack provided for your arrival. The villa is fitted with an alarm if this is required. Outside: Private garden. Barbecue by kitchen. Outside furniture - on kitchen patio, on balcony over looking garden and with views of the sea, and by pool. Garden attended to by local gardener as required weekly. Four sun beds for pool. The pool is a maximum of 1.6 m deep. It is free of chemicals using automatic salt chlorination. The pool can be heated. This will cost 100€/week paid locally. Cleaning / Towels / Linen / Maid service: Main once per week to clean and change linen. Other: Cloakroom off lounge with wash hand basin and toilet. We enjoyed very much our holidays and will certainly come back! The house was spotless, and service was spot on. 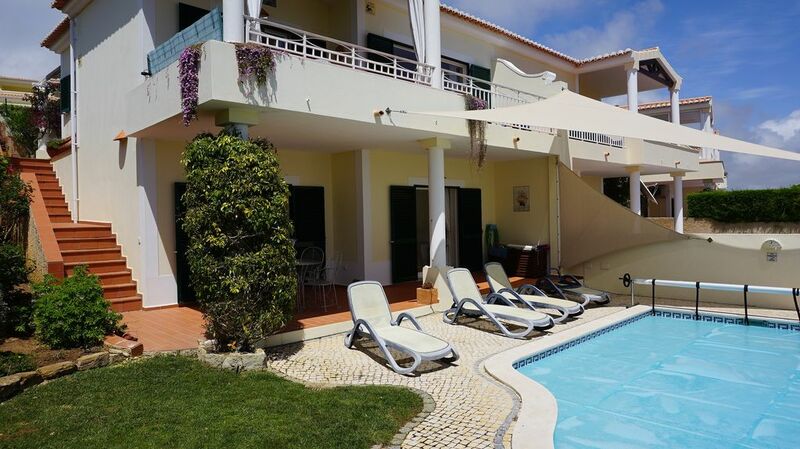 A stunning Villa, with beautiful views over the picturesque Luz and Atlantic ocean. I visited with my Wife and 13 year old son, thevlast week in July. A beautiful, spacious villa with a real homely, welcoming feel about it. Bedrooms were a great size, plenty of storage space and comfortable. The outside is where this Villa truly excels. As it is at the end of the street it boasts a large, beautifully maintained garden. The view is fabulous, we were lucky enough to witness the Blood Moon over the Atlantic ocean from the top balcony. The pool is small but perfect for our needs, my son was rarely out of it when we were at the villa. We used the BBQ a couple of times, thought it may be struggle as it can get windy in the evening. Needn't have worried as it is perfectly positioned to avoid the evening gusts. The town of Luz is lovely, has a real relaxed atmosphere with plenty of bars and restaurants to cater for all tastes. Hope to visit again sometime soon. What can I say? My wife and I together with the local agent try to do the best we can to ensure that visitors have the beats possible time at the villa. villa with two bedrooms and pool There is television with a full range of English channels together with DVD player and CD surround sound. Lovely sea views! We can recommend this place and you will not be disappointed. My wife and I have spent many holidays in your villa. It is excellent in terms of its location, facilities and general ambience. Cristina and her colleagues at Luz Holidays are always helpful. In summary, the villa provides a beautiful, restful holiday. Two small suggestions: better and more specific instructions for the TV and the microwave would be very welcome. Re the TV I will see if I can improve the instructions. Have to admit it is not that easy! Re the microwave. I will try and find the instructions. (think a copy was in a draw in the kitchen) Will also look at some imstructions on it. We had the best holiday at this wonderfully located and furnished Villa. It is what it says in the pictures. Everything worked....the place is quiet and very relaxed. Thank so much. It was very nice of you. Nous avons passé une semaine en famille dans cette magnifique villa parfaitement entretenue et équipée. La vue sur la mer est superbe et les extérieurs très bien entretenus. Que dire de la piscine, idéale pour se relaxer après une journée de visite. La satation de Luz est trés agréable (familiale et pas trop "bondée") avec une belle plage, des restaurants et à proximité de LAGOS. Bref c'était parfait. Scuba diving available in Lagos. Horse riding about 10 minutes to the west of Luz, at Tiffanys. Tennis in village. Local fishing. Sailing from beach at Luz. Dolphin watching from Lagos. There is a nice safe beach in Luz which can be reached on foot from the villa in about 10 minutes. There is a lovely beach to the west at Figueira which is recommended. Faro airport is about 50 minutes away and Lisbon airport about 3 hours away by motorway. Car hire is recommended and can be arranged. Taxi can also be arranged and is about €70/80 each way to/from Faro. There is a bus service to/from Faro airport. This can be arranged if required. The motorway has a electronic toll. This payable to the car hire company. Luz is 10 minutes on foot. Lagos is about 10 minutes by car. Cape Vincente, the most Southwesterly point of Europe is about 30 minutes away by car. Also recommended is a visit to Monchique the highest point in Southwest Europe. There are local supermarkets in Luz and plenty of restaurants in the village. There are banks and cash points in the village. The city of Lagos is well worth visiting. It has a good night life with plenty of restaurants.